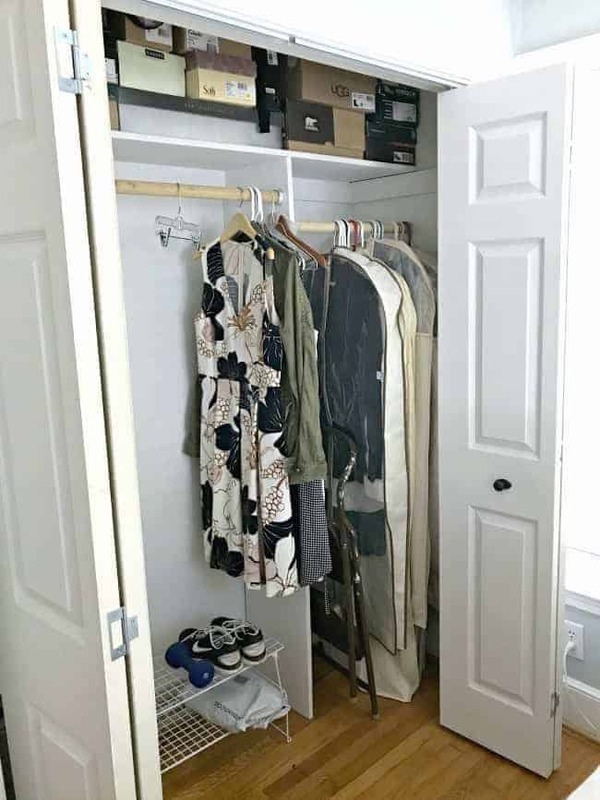 How to build a small bedroom closet where there wasn’t one for added storage and organization. I’m so excited! 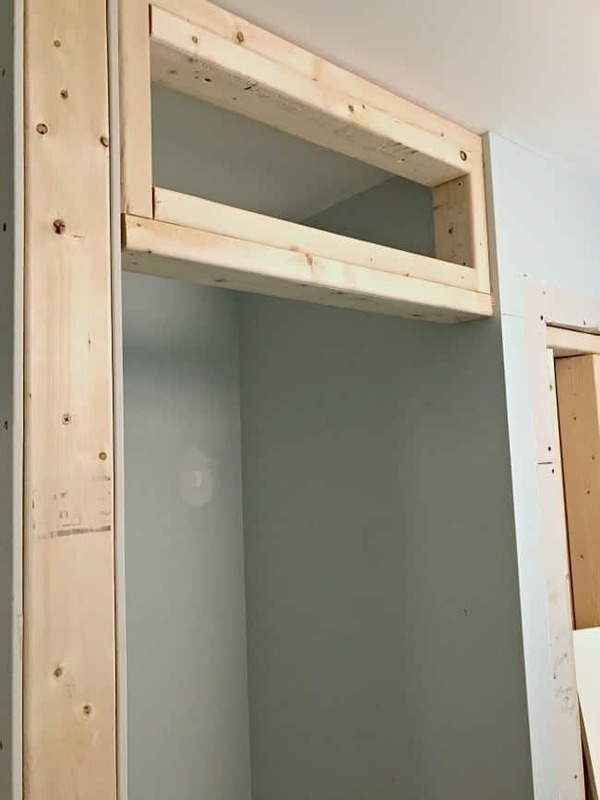 We’ve just finished the DIY farmhouse bathroom vanity so it’s on to the brand new small bedroom closet. We are slowly making progress so I wanted to share where we are with the construction. Just a few short weeks ago, this is how the guest bedroom closet looked. It was just your standard closet with bifold doors. We’ve wanted to add another bathroom since we moved in and this space seemed to make the most sense. With almost all the decisions made, construction began. 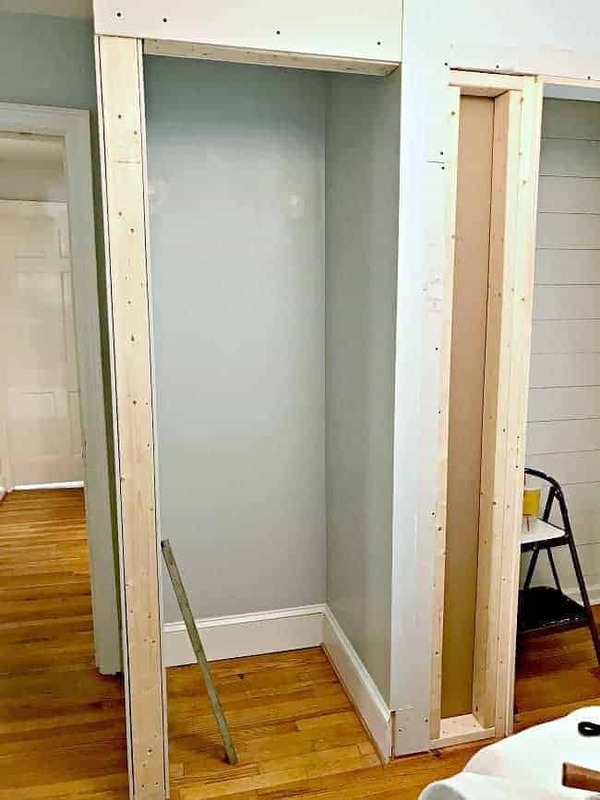 We gutted the closet and started the powder room addition by framing out a doorway and adding new electric. 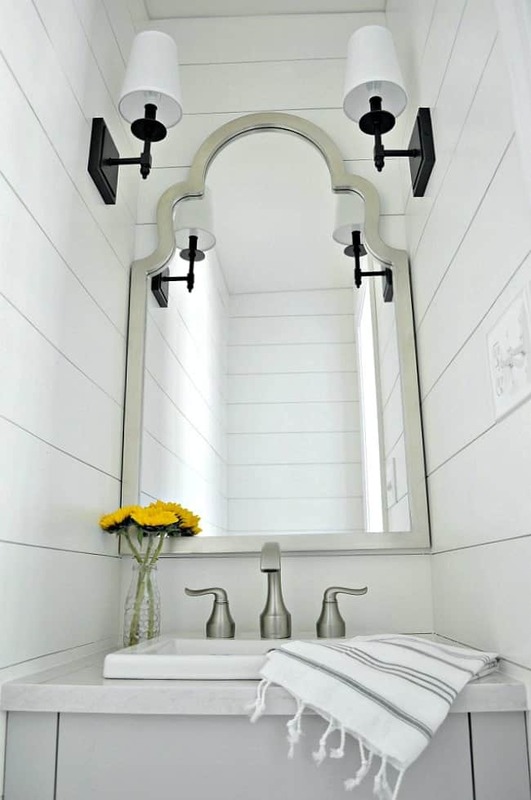 Wood planks, a DIY vanity, sink, faucet, mirror and lighting were added to finish one side of the powder room. 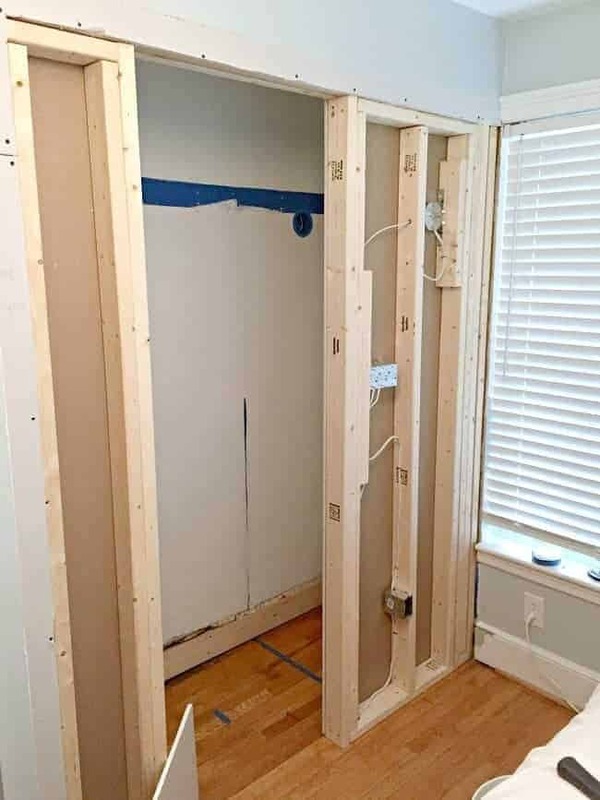 The plumbing for the toilet will take some work so we stopped the powder room construction and started on the new bedroom closet. Although it’s a small area, a lot of thought and planning went into creating both spaces. We knew that if we were going to turn the closet into a powder room, we would have to carve out space for a small bedroom closet. Our house only has 3 closets, one in each bedroom, so for storage sake (and resale), we knew we needed to add one back. 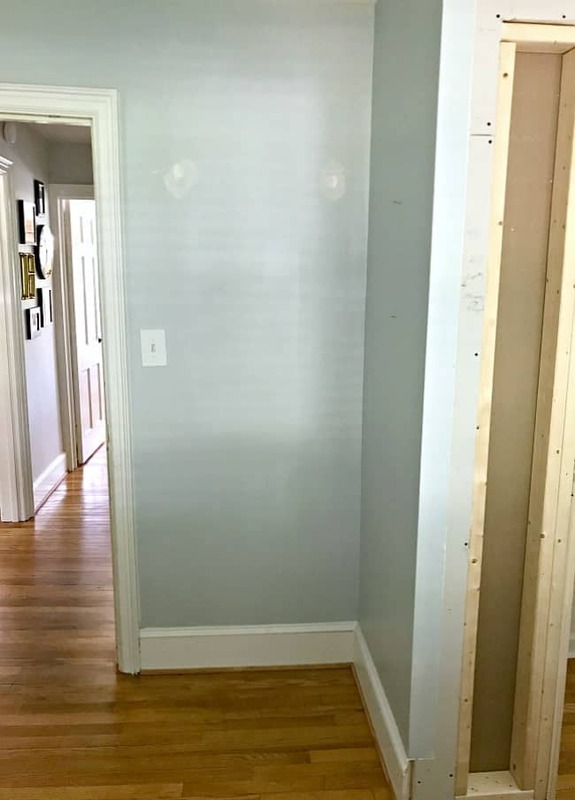 A previous homeowner added the closet (now powder room) in this room, so it was bigger than the other bedroom closets. It also had a weird dead area in the corner next to the doorway. Since it wasn’t good for much of anything, we thought it would be the perfect place for the closet. It will be smaller than the one that was in this room, but it will still have a good amount of storage. We debated about where we should put the wall and decided to take it almost to the entry door trim. In a small space every inch counts, and we needed as much space in the closet as possible. We framed out the closet and ran the electrical wiring. We had to relocate the switch for the bedroom ceiling light and we added a light and switch inside the closet. A small bedroom closet doesn’t really need a light, but it didn’t cost much to add one. With the spackling and sanding finally complete, it was time to decide on trim options for both doorways. This has been a struggle because we can’t decide what we want to do. 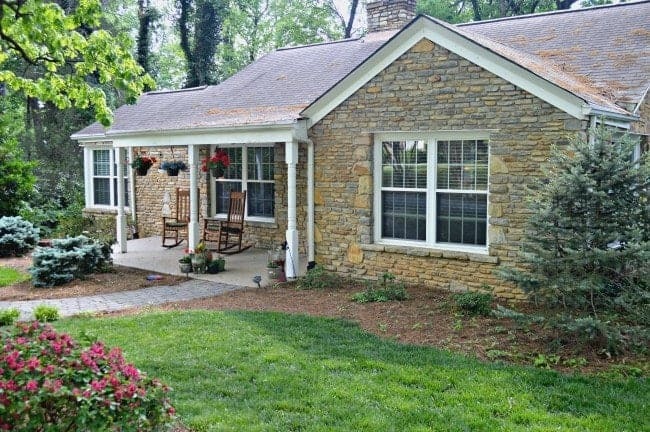 We talked about matching the 70 year old trim but we have a few ideas for both doors and the trim is just too big. To sum it all up…trim. A decision on what trim to use has halted construction. Lame I know, but as soon as we work it out, we’ll move onto the next issue…which is the doors. We have a few ideas about what we want to do but we need to make sure everything works, and looks good. Once we figure it out, we’ll get back at it. No pretty pictures to end with today but we’re working on it. We’re definitely making progress and it’s exciting to see it turn into a whole new space. If you want to check out behind the scenes during construction, you can follow along on Instagram. I usually share what’s happening on IG stories daily. 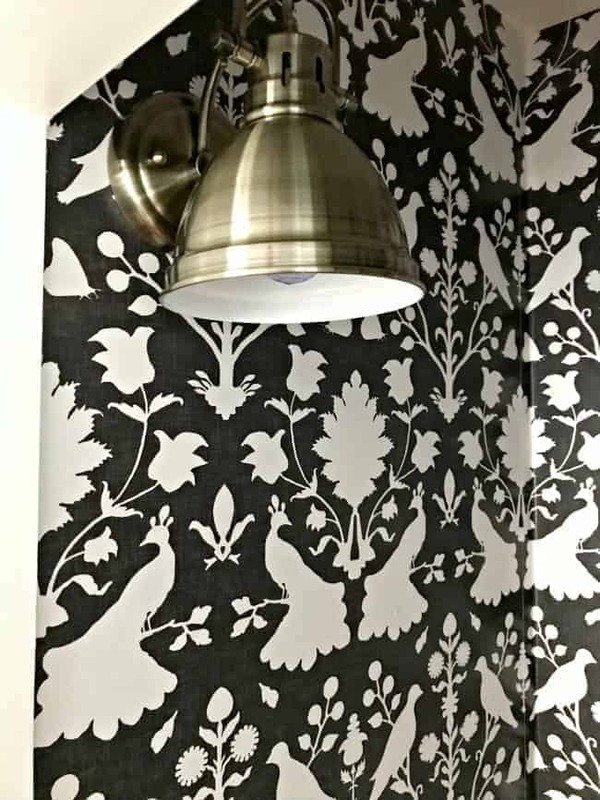 Check out the beginning stages of construction and the powder room details and progress. Oh my, you guys nailed THS project. I love, love, and more love it all. WOW! Kristi, I admire you and hubs for tackling such a big project. I watch some tiny house shows. 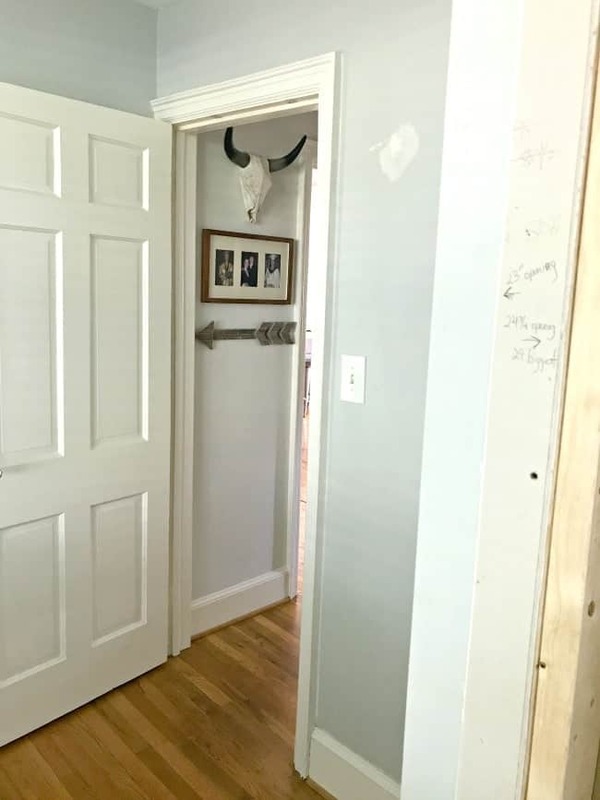 Both closet and powder room are next to each other, so how about a sliding barn door. When the powder room isn’t in use, it covers the closet. When in the powder room the door slides to close the powder room but then exposes the closet. Just a thought. This looks great! What a great use of space, It will be so worth it in the end. Take your time and think about it. It will usually come to you if you take a step back. Thanks so much Julie! I think once we get over this hump we’ll be good (hopefully I didn’t just jinx it 😉 ). So glad you stopped in to visit. Hope the rest of your week is a good one. Thanks so much for your visit and for your kind words about our home. I truly appreciate it. You are so right when you say you have to be sure about your trim decision. To me, trim is like jewelry to an outfit – it can make or break it. 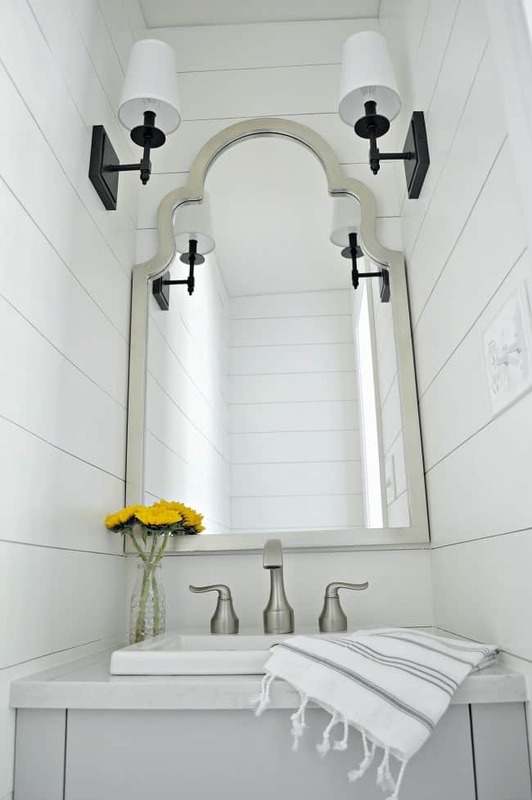 Your bathroom and closet are great additions to your home. Such a difference for your guests (and you) to have the privacy of an additional bathroom. Really smart planning on you and your husband’s part. Can’t wait to see it all finished. I also know about the terrible construction dust. Last week I had new laminate floors laid in all except the bedrooms of my house and that laminate dust. is. everywhere. My garage, where the floor guy used his saw, is even worse. It will take me days and days to get my home back to normal. That dust is in every nook and cranny, high and low. It’s very hot here and the constant air conditioning carried it throughout the house. Yikes…. Construction dust is the worst. It usually takes a long time to get it all up. On the other hand, getting new floors is exciting. I’m sure it will all be worth it in the end. Thanks so much for stopping in Pat. 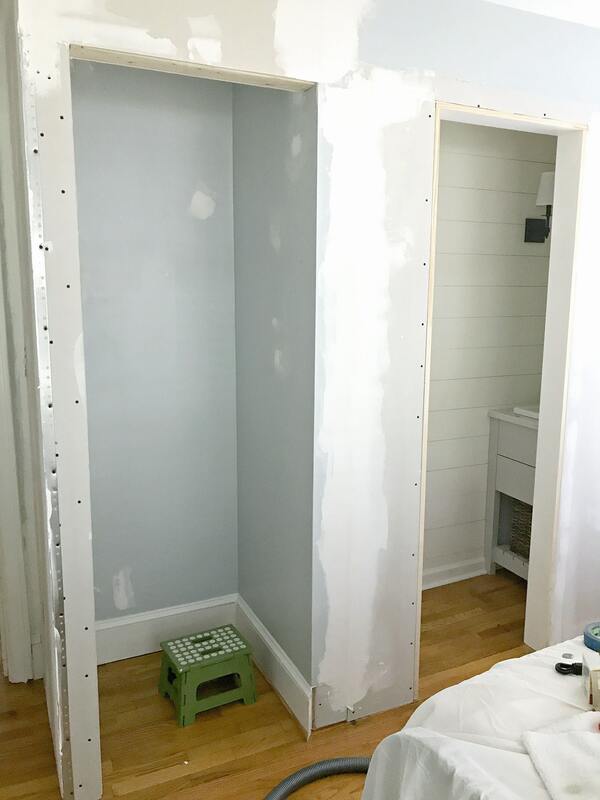 We’re excited to see how the powder room and closet turn out. Hopefully they’re as nice as I envisioned. Kristi, all is looking great! Like you, I take my time when choosing things to get it right the first time. Sometimes walking away for a bit really helps to clear the head, especially during the dog days of summer ! I know what you mean. I am still dealing with the hated mini blinds because I can’t decide on window treatments. I just love your little bathroom, especially the sink area. Have a great week Kristi.